The Orton-Gillingham reading intervention program (OG) was designed in the 1930s by Samuel Orton and Anna Gillingham to develop oral and silent reading skills in children with Reading Difficulties (RD) . This program and programs based on its principles approach intervention as a “systematic, sequential, multisensory, synthetic and phonics-based approach to teaching reading” . At the most basic level, the OG approach utilizes the language triangle - visual, auditory, and kinesthetic/tactile pathways . Phonology, as well as phonological awareness, is taught to children with RD using a ladder of reading skills; starting with groups of letters and moving on to how sounds correspond to each other and blend to form words. Students learn to read and spell both actual and nonsense words, first with tiles and then on paper. Children progress to reading and writing phrases. Reading fluency and accuracy is then targeted using program texts. The instructor dictates a word, which the child then repeats, spells with blocks while saying it, taps out vowel sounds, says the word slowly emphasizing phonological parts of the word, blends the sounds present in the word, says it with the correct speed, and then uses finger spelling . This multisensory approach has been shown to be particularly useful for children with RD . Due to its initial success at a time when few programs were available in schools, as well as based on anecdotal evidence of the results of this program, the OG method and programs based on it are predominately used in schools . However, despite half a century of widespread use in schools, very little empirical evidence exists supporting the use of the OG . Less scientifically-based information is available for the OG compared to other programs. The main body of evidence supporting the OG method has been anecdotal . Success stories from parents and teachers, as well as widespread support of the program from schools has instilled confidence in educators and legislators regarding continued implementation of the OG . However, there is little empirical evidence supporting the superiority of this program over other reading-intervention programs. The studies that do exist have inconsistent findings regarding the effects of the OG on reading skills in children with RD . Among the studies showing slight improvements using the OG method, Geiss et al. demonstrated greater improvement in reading rate in 13-18 year-old children in juvenile detention facilities who underwent the OG for 90 min a day, five days a week, and were tested before and after intervention . However, including children in juvenile detention facilities resulted in incomplete post-testing data. Another study showed that an OG-based program (“The Wilson Reading System”) was more effective in teaching reading, spelling, and phonological awareness skills than was a non-phonetic program for the comparison group . However, other researchers have found conflicting results. A study comparing another OG-based program (“Alphabet Phonics”) and a non-OG approach focusing on comprehension skills, reading efficiency skills, study skills, and test-taking strategies showed that students who were normal readers enrolled in a community college had better performance on post-training measures after the non-OG approach than students in the OG-based group . The authors concluded that OG-based programs must be evaluated more completely and empirically to determine efficacy. Another challenge of using the OG is that it indiscriminately covers all domains in reading . Morris and colleagues identified “subtypes” of children with reading difficulties (RD), such that some children experience difficulties with fluency, reading comprehension, or phonological processing . Thus, differential attention may need to be given to each of these reading domains . Spending precious time on all domains of reading for all children instead of targeting specific skills for individual children may cause additional delays in reading improvement. OG-based programs are used widely in schools across the United States and internationally . Such programs are intensive and costly interventions, requiring both the financial and personnel resources to provide one-on-one training daily for children with RD. Parents often request OG-based programs for their children and have won lawsuits against school districts for the right to have this method available under the Individuals with Disabilities Education Act or IDEA . However, there is a distinct lack of empirical evidence supporting the efficacy of the OG method, particularly in comparison to the myriad of daily intervention programs available. Most supporters of the OG, including many parents of children with RD, base their opinions on word-of-mouth testimonials and how far-reaching the programs seem to be . A wider, as well as more experimental, knowledge base is required to examine the impact the OG has on the reading skills of children with RD . There is also a need to investigate the most effective methods of implementation of reading intervention programs in schools , as current methods are extremely variable from one school to another. There is a federal requirement for scientifically-based reading research [No Child Left Behind, 2002, Part B, Subpart 1, Section 1208 (6)(A)] that has neither been upheld nor examined in the case of the OG . Given the massive amounts of money, time, and personnel devoted toward this method, as well as the significant portion of students who struggle with RD, the goal of the current study was to determine the effects of OG training in children with RD compared to an age-matched group of children with RD who participated in a web-based reading intervention program for the same time and intensity on both oral and silent reading skills. We hypothesized that children who participated in the OG and children who participated in the web-based intervention in school would demonstrate reading improvement (i.e., reading speed, accuracy and comprehension). We also hypothesized that no differences in gains in reading skills would be found between the two groups. We speculated that greater gains in oral reading would occur in both groups due to the intensive oral-reading practice involved in both interventions. Ninety-seven elementary and middle school students in 1st through 7th grades (6-12 years of age) from a private school in an urban Midwestern state participated in the study (n=58 females; n=39 males). Sixty-three students (n=40 females; n=23 males) participated in the OG (“OG group”) and 34 students (n=18 females; n=16 males) participated in the web-based program (“WB group”), which was the ongoing intervention program in the school. Students participated in either program for three months and completed accuracy and speed reading measures for both oral and silent reading before (Test 1; in the fall) and after (Test 2; in the winter) intervention. The children were classified as experiencing RD by the school by scoring at or below the 25th percentile on tests for oral and silent reading speed (i.e., fluency), reading comprehension, and oral and silent reading accuracy (i.e., decoding and orthographical skills, respectively) using the AimsWeb reading-assessment program (https://aimsweb.pearson.com/) . To assess the effects of both interventions implemented in this study, we used the AimsWeb Reading Curriculum- Based Measurement (R-CBM), which is a brief, individually administered, standardized test of speed and accuracy of oral reading for grades 1 through 12 . More specifically, the R-CBM uses 1-min probes that require students to read aloud to a test administrator. The number of Words Read Correctly or WRC (i.e., speed) in 1 min and accuracy, defined as the number of errors, are scored. Words that are mispronounced, substituted, omitted, or read out of sequence and that the student does not correct within 3 s, are recorded as errors. The AimsWeb Maze Curriculum-Based Measurement (M-CBM), which is a 3 min, group-administered assessment of silent reading fluency and comprehension, was also used. M-CBM is a multiple-choice cloze task in which students silently read pages 150 to 400 words long. Except for the first sentence, every 7th word is replaced with three words presented inside parentheses. Students are instructed to select the exact word from the original passage. The number of targets correctly identified in 3 min is scored. Children completed both measures before (Test 1) and after (Test 2) intervention. Both measures have high reliabilities and acceptable validity according to their technical manuals. Orton-Gillingham: The OG curriculum, 45-60 min in duration, was given daily to the children in the OG group [according to the Gillingham Manual; Remedial Training for Students with Specific Disability in Reading, Spelling, and Penmanship] . Materials used included Phonics Drill Cards, Phonetic Word Cards (Jewel Case), Little Stories (I-IV), Merriam Webster’s Elementary Dictionary, and a rough surface . Students were taught and practiced groups of letters, and spelling patterns were introduced with the corresponding letter groups. Web-based program: Children in the WB group met with the school reading specialist for 45-60 min daily. The tutor covered aspects of phonology, orthography, fluency, and comprehension in small groups using a program called Achieve3000 [http://www.achieve3000.com/; which is a web-based, differentiated reading program for grades K through 12. Students read articles taken from the Associated Press that are rewritten at 12 different levels such that students read the same articles, but they are targeted to the individual student’s reading level. The program is designed to strengthen vocabulary, comprehension, reading fluency, and writing using a five-step process: (1) Read and respond to KidBiz or Teenbiz; (2) Read the article of the day; (3) Do the activity; (4) Answer the thought question; and (5) Vote in the poll. Students may complete the process independently. Reading specialists may provide scaffolding of the activities by pre-teaching vocabulary, activating prior knowledge, developing schema, and building curriculum units. Students participated in the OG and the WB programs for 3 months and completed accuracy and speed reading measures for both oral and silent reading before (Test 1; in the fall) and after (Test 2; in the winter) intervention using the Aimsweb program. Both interventions were administered by a certified OG-trained reading specialist. We performed a repeated-measures 2 x 2 x 7 ANOVA of Group (OG and WB as the control) x Modality (silent versus oral reading speed and accuracy) x Grade (1st-7th) for each grade level to determine whether we could combine all grade levels into one group. This analysis resulted in non-significant interaction for Grade level x Group [F(5,85)=0.326, P=0.864, ÃÂ³2=0.023], as well as a lack of Grade level x Group x Modality interaction [F(5,85)=0.857, P=0.51, ÃÂ³2=0.048]. Since no significant effect of each of the interventions was found across ages, we collapsed the 1st-7th grade levels into one group for all statistical analyses procedures. Statistical analysis proceeded in two distinct phases; a descriptive phase and an inferential phase. Descriptive statistics were used to describe the basic features of the data. The measure of gain in speed and accuracy were computed by taking the difference between the two testing time points (pre- and post-training) across groups. In the inferential phase of the study, a series of t-tests were conducted to test whether significant differences existed between groups for each measure of speed and accuracy for each time point. A series of paired t-tests were then conducted to determine whether significant changes in speed and accuracy existed within each intervention group. A chi-square test, stratified by gender, was used to test the association between gender and grades across intervention groups. Since the frequency was less than 5, a Fisher’s exact test was used. Finally, regression analyses were conducted to test two models; one with difference in speed (or gain in speed) and one with difference in errors (or gain in accuracy) between two time points as the outcome measures. A quantile–quantile plot was used to determine whether the outcome measures were normally distributed and amenable to analysis with traditional parametric techniques. All analyses were conducted with SAS statistical software, version 9.4 (SAS Institute Inc., Cary, NC, USA) . Fisher’s Exact test, stratified by gender across groups, failed to reject the null hypothesis, suggesting that there was no statistically significant relationship between gender and grades across groups (OG: P=0.25; WB: P=0.33). We compared baseline performance between the groups for all measures using an independent-samples t-test. For the silent reading test, no significant differences were found in the number of questions correctly answered in 1 min between the groups (OG: M=14.69, SD=9.07; WB: M=14.75, SD=6.91); t(95)=-0.03, P=0.975). Similarly, the two groups showed no significant differences in the number of errors made in 1 min (OG: M=2.81, SD=3.47; WB: M=1.96, SD=0.22); t(95)=1.257, P=0.21). When comparing oral reading-speed measures, no significant differences in the number of words correctly read in 1 min were found between the two groups (OG: M=98.30, SD=41.51; WB: M=92.93, SD=35.84; t(95)=0.626, P=0.533). Likewise, the difference in the number of mistakes made in both groups failed to reach significant levels (OG: M=3.47, SD=4.89; WB: M=3.65, SD=3.78; t(95)=-0.182, P=0.856) (Table 1). These results suggest that reading levels were similar across both groups before training, creating ideal conditions for post-training comparisons. Table 1: Silent and oral reading speed and accuracy by intervention group and testing period. We examined the effect of training for both groups separately using a paired t-test. 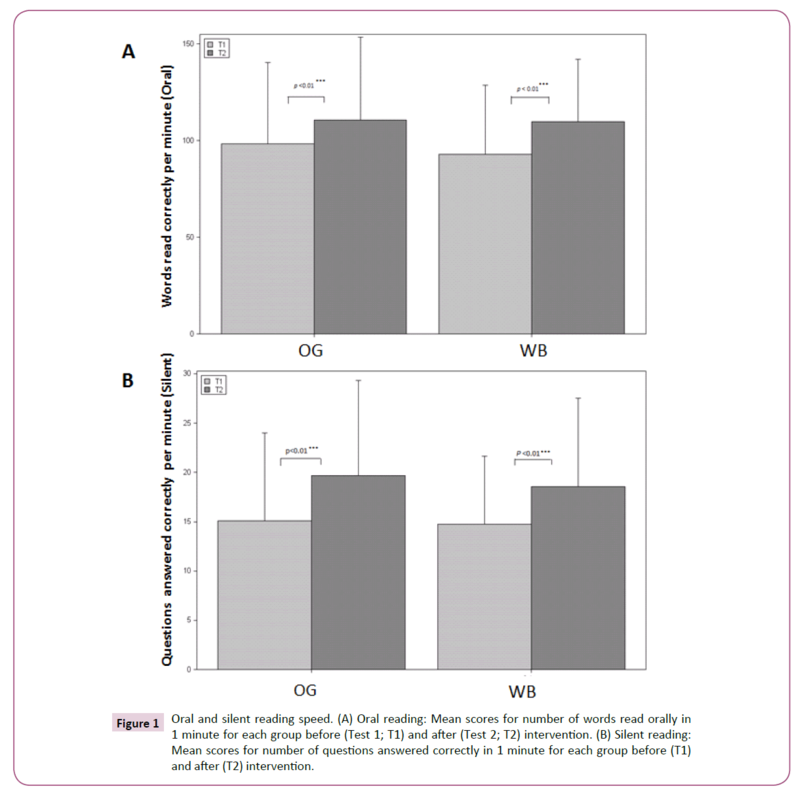 Although no significant improvement was found related to the number of errors in the silent reading test, the OG group did show positive results from the training in every other area, with higher scores after training (Test 2: M=19.84, SD=10.32) than before training (Test 1: M=14.69, SD=9.07) for silent reading speed [t(64)=-6.04, P<0.001]. For oral reading speed (i.e., fluency), the OG group read more words correctly after training (Test 2: M=110.26, SD=42.23) and made fewer errors (Test 2: M=2.35, SD=2.58) than before training [Test 1, speed (M=98.30, SD=41.51; t(64)=-6.86, P<0.001 and Test 1, errors: M=3.47, SD=4.89; t(64)=2.317, P<0.05]. For the WB group, for the silent reading there was a significantly higher number of correct responses after training (Test 2: M=18.56, SD=8.98) than before training (Test 1: M=14.75, SD=6.91; t(31)=-3.62, P<0.01). Similarly, oral reading speed, for which students read more words correctly per minute, also increased more for Test 2 (M=109.68, SD=32.40) than for Test 1 (M=92.93, SD=35.84; t(31)=-8.41, P<0.001), while fewer mistakes were made for Test 2 (M=1.91, SD=1.51) than for Test 1 (M=3.65, SD=3.78; t(31)=2.79, P<0.001) (Table 1). In the before and after intervention comparisons, the OG group made significant improvements in both oral and silent reading speed and accuracy and the WB group made significant gains in both oral and silent reading speed, as well as oral reading accuracy. A small decrease was found in the WB group in silent reading accuracy, but this decrease was not statistically significant. Taken together, the results indicate improvements in oral reading speed and accuracy, as well as silent reading speed, for both intervention programs. We also investigated possible differences in the gain provided by these reading programs by analyzing the resulting value from the subtraction of Test 1 values from Test 2 values. An independent samples t-test was used to determine the differences in gain between the groups. We found no significant differences in the gains between the groups for any of the measures, suggesting that both programs were similar in their effectiveness (Table 2). Table 2: Changes in silent and oral reading speed and accuracy by intervention group. We performed a two-by-two ANOVA for Group (OG, WB) and Modality (difference between Test 1 and Test 2 in silent reading speed, difference between Test 1 and Test 2 in oral reading speed) to assess the differences in oral and silent reading speed, with Modality and Group as factors. We found a main effect of Modality [F(1,95)=34.633, P<0.001], with gains being higher for oral reading speed than for silent reading speed (Figure 1). Figure 1: Oral and silent reading speed. (A) Oral reading: Mean scores for number of words read orally in 1 minute for each group before (Test 1; T1) and after (Test 2; T2) intervention. (B) Silent reading: Mean scores for number of questions answered correctly in 1 minute for each group before (T1) and after (T2) intervention. Similarly, we examined the effect of the OG and the WB programs on reading accuracy using a two-by-two ANOVA for Group (OG, WB) and Modality (difference between Test 1 and Test 2 in silent reading errors, difference between Test 1 and Test 2 in oral reading errors), with gains in accuracy as the dependent variable and Modality and Group as factors. Analogous to the speed-comparison results, we found a main effect of Modality [F(1,95)=5.087, P<0.05], with gains being higher for silent reading accuracy than for oral reading accuracy (Table 1 and Figure 2). Figure 2: Oral and silent reading accuracy. (A) Oral reading: Mean number of errors made during 1 minute of oral reading by group before (Test 1; T1) and after intervention (Test 2; T2). (B) Silent reading: Mean number of errors made during 1 minute of silent reading by group before (T1) and after intervention (T2). Finally, we performed paired t-tests on each group separately to examine whether there was greater improvement of silent versus oral reading in either speed or accuracy. The OG group showed greater improvement in oral (M=11.953, SD=14.03) compared to silent reading speed [M=5.15, SD=6.87; t(64)=-3.414, P<0.01]. 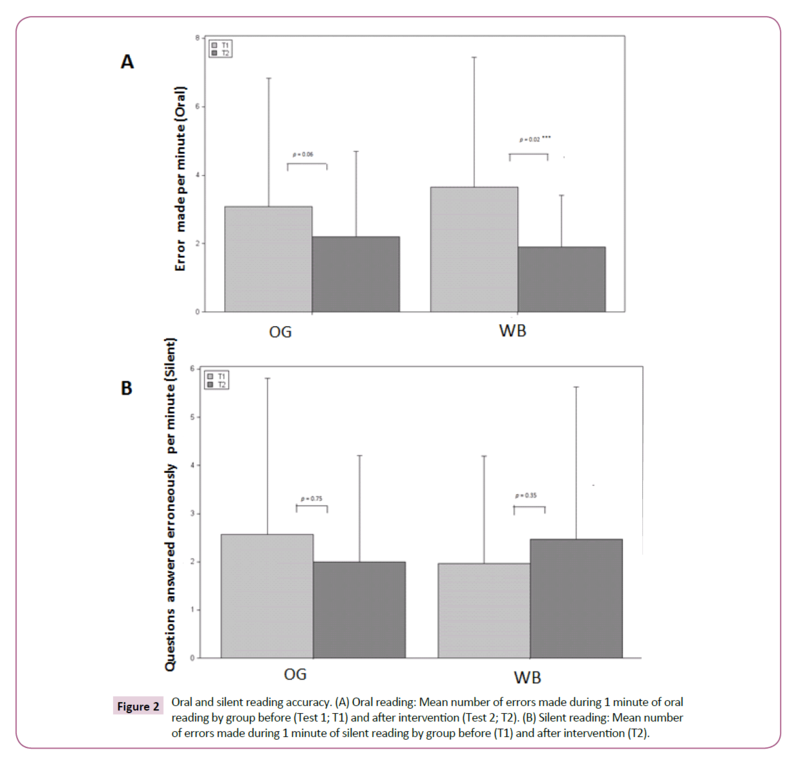 The WB group also showed greater improvement in oral (M=16.75, SD=11.25) compared to silent reading speed [M=3.81, SD=5.94; t(31)=-5.09, P<0.001], while also achieving better performance in oral reading (M=1.75, SD=3.54) compared to silent reading accuracy [M=-0.50, SD=3.02; t(31)=-2.478, P<0.05]. The aim of the current study was to fill a knowledge gap currently present in the literature concerning the effectiveness of the OG in developing the reading skills of children with RD. Our hypothesis was that children who participated in the OG and children who participated in web-based interventions in school would demonstrate reading improvement. Our results indicate that, despite an improvement in both reading speed and accuracy in both intervention groups, as hypothesized, no significant differences were found between reading gains in the OG and WB groups. Also, greater gains were made in both groups in oral reading compared to silent reading for both speed and accuracy. Our study suggests that students who participated in the OG made similar gains to children who participated in the web-based reading intervention program. In both training groups, children with RD made gains in both speed and accuracy for both oral and silent reading. These results indicate that the OG and web-based methods for reading intervention are comparable. The OG is characterized by at least 1 h each day of intensive, one-on-one training with a tutor, with the aim of improving phonological awareness, reading speed and comprehension, and literacy . This may result in providing children with intervention in domains in which they do not necessarily have a primary difficulty. According to Morris and colleagues, there are at least seven subtypes of reading-specific language disability, all of which require different intervention methods to attain the most successful results . For example, a child with the Phonology-Verbal Short-Term Memory-Lexical disability, who displays a singular strength in visual attention , may benefit more from a visual-based intervention program than a child with phonological difficulties whose specific strength in speech production would suggest a more successful intervention relying on oral reading skills. Using an intervention program that can be used for all students with difficulty reading may limit the efficacy of the intervention for most individual students. In the specific case of the OG, deficits being remedied are assumed to be phonological since the method is based on teaching phonological awareness, morphology, sound-syllable correspondence, and sentence comprehension  to increase gains in skills in all areas of reading fluency and literacy. Another recent study suggested that children with RD who have resilience characteristics (i.e., show a large discrepancy between reading comprehension and decoding abilities) show greater resilience mechanisms, such as greater grey-matter volumes in regions related to executive functions (i.e., the dorsolateral prefrontal cortex) . These results strengthen the notion that within the RD group, there are children who demonstrate different needs and therefore, differential emphasis on reading comprehension versus decoding or fluency may be warranted. The results of Patel and colleagues indicate that an overemphasis may be being placed on developing phonological skills, leading to a lack of gain in non-phonological literacy skills such as contextual reading fluency . Children in both intervention groups had improved speed and accuracy in both oral and silent reading. However, the gains made in oral reading were greater than those for silent reading in both speed and accuracy for both groups. This finding may be explained by the fact that most programs, including the OG and web-based programs investigated in this study, focus on phonological awareness, rather than on silent reading accuracy. The OG and other interventions tend to focus on oral reading and phonics, probably due to the nature of working one-on-one with a tutor and reading aloud the written material. Even the silent reading intervention is based on phonological awareness in these programs, and they have been developed in this way because understanding basic phonological concepts is the basis for reading . The programs emphasize this because most children with RD struggle with phonology more so than silent comprehension or accuracy . Indeed, Morris and colleagues found that in 4-out-of-5 reading-specific subtypes, a relative weakness in phonological awareness was present . Our results also show that in the WB group, a tradeoff between speed and accuracy was observed, but only in silent reading. Although silent reading speed improved after the intervention, more errors were made in this group. This increased error rate following intervention was not large or global enough to reach significance, but it does suggest a potential weakness in the curriculum of both OG-based programs and other reading interventions. The universal focus of reading intervention programs on development of oral and phonological skills  may leave deficits in the realm of silent reading. Children with RD who have gone through reading intervention programs relying on oral skills tend to approach silent reading with the same methods, using phonemic awareness and sound-syllable correspondence  rather than sight words and sentence structure, which can lead to reduced speed and accuracy in silent reading. The aims of Dr. Samuel Orton, one of the founders of the OG method, shed light on the processes and goals of the intervention program. According to Dr. Orton, a reading intervention program should intend to improve for those with RD “auditory competence by teaching them the phonetic equivalents of the printed letters and the process of blending sequences of such equivalents so that they might be able to produce for themselves the spoken form of the word from its graphic counterpart” . This approach clearly emphasizes oral reading over silent reading, despite the integral role silent reading plays in academic and intellectual development, as well as this being an essential skill for students and adults. The results of the current study should be considered with the following caveats. First, since we did not find any difference in gains between the different age groups, we grouped the participants from 1st-7th grade (Grade 1 M age=7.64 years; Grade 7 M age=12.95 years) into one group. Doing this allowed the effectiveness of the OG to be assessed on a more global scale and at a range of ages that is representative of the population of students currently using these programs in school. However, it eliminated the basic differences between the different reading levels in each grade-level. A follow-up study should examine the effects of the OG on subgroups of children at different reading stages. Second, we used the Aimsweb measures to assess the effectiveness of the interventions. Although Aimsweb is widely distributed in schools, it uses the same materials in each testing, which may result in practice effects that could result in an improvement following intervention. However, since the aim of the current study was to examine the specificity of the OG intervention on reading measures, we were mainly interested in determining the differential effect between the two interventions. Nevertheless, the results prompt an additional study using standardized reading measures within the current study design. Third, due to practicalities associated with field research in a school setting, it was not possible to conduct fidelity checks for the implementation of either intervention. According to the National Institutes of Health, “reading is the primary difficulty for most children with learning disabilities receiving special education services” . The OG is costly to implement, in both financial resources for purchasing materials and in training and subsequently procuring the necessary number of hours from interventional instructors . For example, the basic level of OG training for a teacher costs approximately $700 and takes 49 h. In contrast, the cost for Achieve3000 is approximately $15,000 for 250 individual licenses per site. Although null results are often not published, they are important here because the results of this study indicate that the OG may result in similar outcomes compared to other programs. Thus, steps may need to be taken to determine a less costly and more effective method of reading intervention to be implemented in schools for the existing variety of reading challenges (i.e., phonology, orthography, fluency, morphology, and comprehension) in children with RD. We suggest that in order to implement the most effective intervention, specific deficits should be mapped and addressed in children with RD. Intervening in specific subtypes of impairment, rather than addressing RD globally, will allow for greater gains in reading skills. Further studies should examine the effectiveness of online reading programs to improve silent reading and investigate how to address deficits in silent reading skills. For example, adolescents with co-occurring RD and Attention Deficit Hyperactivity Disorder or ADHD are a large percentage of children with RD and show specific deficits in silent reading . Another possible implication of our study is that the programs investigated utilized daily intervention with a tutor that is physically with the student. This instructor monitors the progress of the reading skills of the student through oral reading. However, computer programs could determine and subsequently intervene in the silent reading skills of the student, an area we found to be globally underdeveloped. Future studies should further examine how adding an online component to reading intervention programs can improve silent reading skills in children with RD [13-16]. Gillingham A, Stillman BW (1960) Remedial training for children with specific disability in reading, spelling, and penmanship. Cambridge MA: Educators Publishing Service. Geiss S, Rivers KO, Kennedy KS, Lombardino LJ (2012) Effects of multisensory phonics-based training on the word recognition and spelling skills of adolescents with reading disabilities. Rose TE, Zirkel P (2007) Orton-Gillingham methodology for students with reading disabilities: 30 years of case law. J Spec Educ 41: 171-185. Ritchey KD, Goeke JL (2006) Orton-Gillingham and Orton-Gillingham-based reading instruction: A review of the literature. J Spec Educ 40: 171-183. Wilson BA (1996) Wilson reading system. Millbury, MA: Wilson Language Training Corporation. Chandler CT, Munday R, Tunnel JW, Windham R (1993) Orton-Gillingham: a reading strategy revised. Reading Improvement 30: 59. Morris RD, Stuebing KK, Fletcher JM, Shaywitz SE, Lyon GR, et al. (1998) Subtypes of reading disability: Variability around a phonological core. J Educ Psychol 90: 347-373. Bartolo P, Hofsaess T, Koinzer P (2005) How teachers in the region of Saxony and Malta are similar and different in their response to the diversity of students in the primary classroom. Presentation at the annual international conference of the Association for Teacher Education Europe, Amsterdam. Shinn MR, Shinn MM (2002) AimsWeb training workbook: Administration and scoring of reading maze for use in general outcome measurement. Eden Prairie, MN: Edformation. NCS Pearson Inc (2012) Aimsweb Reading Curriculum-Based Measurement administration and scoring guide. Pearson Education Inc.: Bloomington, MN. Starkman ( SAS Institute Inc., Cary, NC, USA) (2007) Reading first... technology second? the federal early-literacy program gets a big boost from tools used for professional development and personalized student instruction but that potential is too often going unrecognized. THE Journal Technological Horizons in Education 34: 38. Patel S, Farris E, Black J, Hancock R, Gabrieli JD, et al. (2015) Prefrontal cortex as a protective factor in reading: How the brain enables reading comprehension despite less proficient decoding. Poster presented at the Cognitive Neuroscience Society Conference, San Francisco. Mody M (2003) Phonological basis in reading disability: A review and analysis of the evidence. Reading and Writing 16: 21-39. Orton ST (1937) Reading, writing, and speech problems in children. Chapman and Hall: London, UK. Ghelani K, Sidhu R, Jain U, Tannock R (2004) Reading comprehension and reading related abilities in adolescents with reading disabilities and attentionÃ¢ÂÂdeficit/hyperactivity disorder. Dyslexia 10: 364-384. Erguvan D (2014) Instructors' perceptions towards the use of an online instructional tool in an academic English setting in Kuwait. TOJET 13.